So, have I gushed about how amazing and successful the writers in my YA Book Club are? Yeah, I know I have, so just bear with me. With all of their books coming out, I am totally living vicariously through them. I wanted to make some kind of mementos to help celebrate their books. And since I just happen to have a hand-stamped jewelry business I can write whatever I want on my jewelry pieces. So, I decided to make key chains with their book names on them. It's part of the Louder Than Words series, and it's about her experience as a teen living with Anxiety Disorder. AMAZING! SO proud of her! 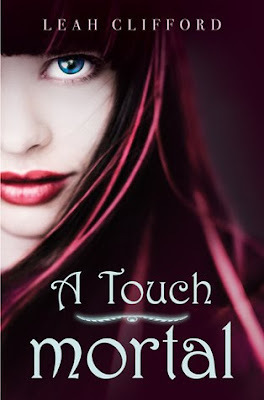 Leah Clifford's book, A TOUCH MORTAL comes out this February (and I am currently Reading an ARC of it--LOVE)! Here's the tag line: She's been BETRAYED... by life, by death, and by love. Anyway, here are the key chains I made for Chelsea and Leah. I hammered the sterling silver tags, and added Swarovski crystals in their favorite colors. The tags can also be made into necklaces instead. Next books up, for 2011? WITCH EYES by Scott Tracey, BLUE & EGG by Lindsay Ward, and LIAR SOCIETY by Lisa and Laura Roecker! Oh, and Niki Smith just released a digital comic called IN MAPS AND LEGENDS. Those are beautiful. What a great way to celebrate. So nice of you. Those are gorgeous!! You're in VERY good company--you'll be next! How nice of you to write a post to celebrate them. I hope you're next too! You are a fantastic friend! Those key chains are beautiful, too. Ahh! Love!!! What will you do for your book when it comes out? So cool! You're such a great cheerleader. And when your book comes out, you'll have a great support system in place. Such cute key chains! Yay for all the success of your book club! Those key chains are so beautiful. Congrats to your critique group! Thank you!! So nice of you. :) I love it. Gorgeous! And how thoughtful of you, too. I can't believe I would ever say there was a reason for me to want to live in Ohio, but you guys are definitely it :). That's some book club!!! Hopefully, soon you'll be able to include YOUR book in the lineup. Awesome key chains! And may I say how JEALOUS I am that this is your book group??? Hope yours joins the ranks soon! Those are gorgeous keychains and wow not only are you lucky to have a book club... your bookclub is full of awesome. What is going on in Ohio? Can you throw a little of that my way, sister?! Nice shout out! And I really love the keychains!!! How cool is Leah's cover! So pretty! And congrats to Chelsea! I lurv the keychains! Oh my gosh, you are too much! Thanks for the shout out. I heart the book club.